The Crow and the Powderpuff | A Creative Makeup & Beauty Blog: Urban Decay Cosmetics Website Makeover Celebration Sale! Ends Today! Urban Decay Cosmetics Website Makeover Celebration Sale! Ends Today! 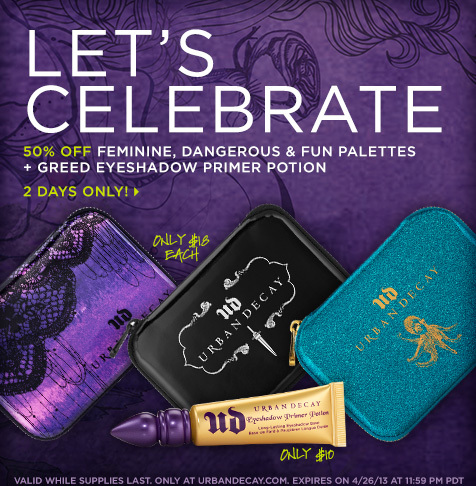 Right now Urban Decay has a 50% off sale on the Femine, Dangerous, and Fun Palettes to celebrate the makeover of their website as well as Greed Primer Potion for $10! This sale ends tonight at 11:59pm PDT so check it out if you've been wanting these items!